It starts with classical music. It always does. Any time someone tries to trace the roots of heavy metal, we inevitably wind up at the same branching paths. We hit the ’70s and the Black Sabbath era, and that leads us to the blues and from there things get far more nebulous, but through some sort of inherited wisdom over the years we always come back to classical music. Composers like Bach and Wagner are name-dropped left and right, and we always point to the huge, bombastic symphonies and the low, bass-heavy instruments, because these are the deepest roots of our heavy metal lineage. The tendency to make things ‘heavier’ isn’t a new one, its just the one that musicians have often seen fit to push beyond the most extreme boundaries imaginable. So, the idea of Symphonics being a part of heavy metal was an almost foregone conclusion. It’s slowly worked its way even into death metal – itself a container of the hidden flair for the dramatic – and the two have produced multiple pairings and fantastic bands. 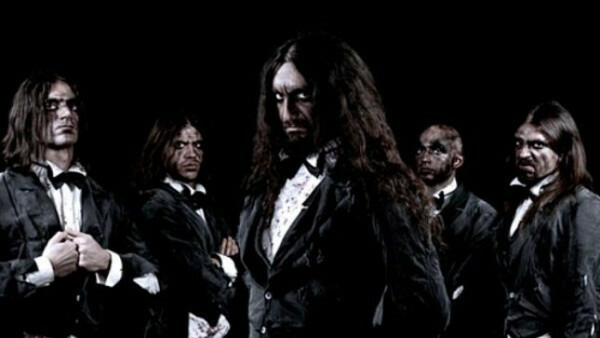 Fleshgod Apocalypse are the natural evolution of that tendency, a group who over the course of four main releases (counting our current subject as well) and an EP have become completely intertwined with symphonic music, writing a pyrotechnic and operatic style of death metal that can’t really be matched. King reveals a band who have taken some obvious lessons from their time with Labyrinth in terms of both composition and mix, as well as having taken some lessons in restraint and dynamics. King is a twelve-song affair, ten if you want to be more realistic, seeing as how there’s an intro track and a traditional piano-piece closer that also happens to be the title track (which has been the case since Oracles — Mafia, Agony, and Labyrinth all have the same thing in play). So in that sense King is going to be treading on some familiar ground. Like its predecessors, King is a concept album, although the band have remained purposefully vague as to the particulars of what might be happening during said disc. There’s an overarching concept and the clear presence of certain characters, as well as narration in a few songs, but, like anything dealing with royalty, there is madness. Because there is always a hint of madness, and madness as it happens to stand works very well within the boundaries of Fleshgod’s brand of blisteringly fast and over-the-top death metal. Blame it on my schooling, but I actually played in the elementary and middle-school versions of orchestra while growing up in the Bay Area. Because of this, I have always had a soft spot for orchestral and symphonic works in my music, and so the nature of the draw to bands like Septic Flesh and Fleshgod has always been somewhat unspoken. Those are bands who do more than just have their keyboardist/backing tracks consist of the usual one or two notes for sheer ambience. making things seem more epic than they appeared. These are bands who interweave their music with it, so that the two become inseparable; one doesn’t really work without the other. It’s not death metal plus symphony. These bands immediately come to mind as examples of full symphonic death metal. 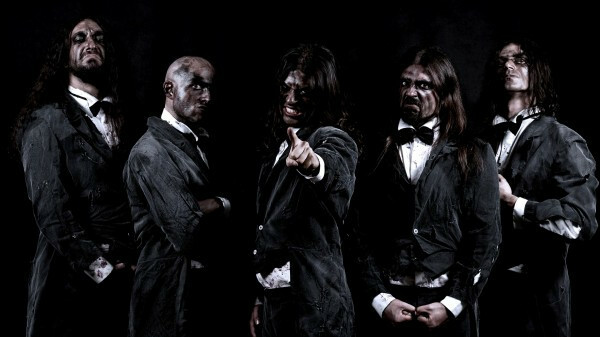 Fleshgod Apocalypse just happen to be the most extreme at it. 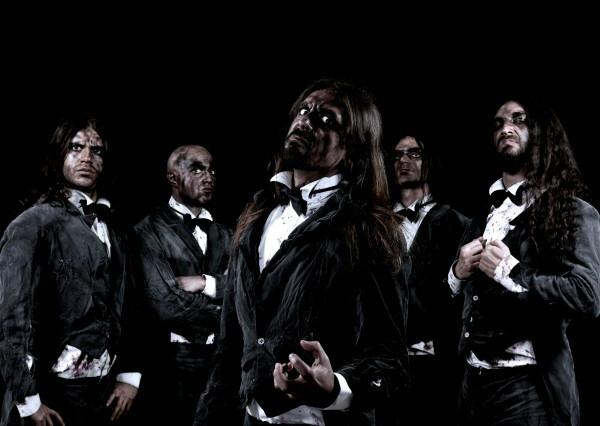 Since Agony, Fleshgod have gone fully operatic. It has led me to believe that mixing a Fleshgod Apocalypse album must initially be a terrifying proposition. Fleshgod Apocalypse bring a lot to the table from a sheer sound perspective, and having to make it so that the album doesn’t just come off like wind rushing through a tunnel has to be a severe feat of strength. I mention this up-front because King is probably one of the best ‘sounding’ of the band’s records to date, from a technical perspective. Every instrument has room to breathe, the group’s orchestration sounds huge, the drums come across as thick as redwood trees, and yes, even the bass guitar is not only detectable but actually has some standout moments of its own. I mention this all up-front because one of the initial questions about how King would fare was whether it would be a wall, production-wise, like the last two albums. (Labyrinth is an awesome album, but the disc is also insanely loud, and there are times where so much is happening that everything just becomes artillery fire). One of the initial selling points for Fleshgod Apocalypse – at least for me – was the sense of awe at just how fast drummer Francesco Paoli was behind the kit. There was a sense of shock at how quickly he could blast. Initially, it felt like a lot of Fleshgod’s music was written around that. Much of Oracles thru Agony basically boils down to rapid-fire blast fests at insanely high speeds. With Labyrinth the band began to pull away from that, and King continues that trend – a surprising amount of the drumming on King is dynamic and feels written to tie into the music. There’s still the fair share of lightspeed hyperblasting, as that brand of death metal is Fleshgod’s stock in trade, but the drums aren’t as overpowering in the songwriting as they have been on previous efforts. “Restraint” is probably a word that pops up rarely in the Fleshgod vernacular, but as the drums go, so goes a lot of the band’s music. 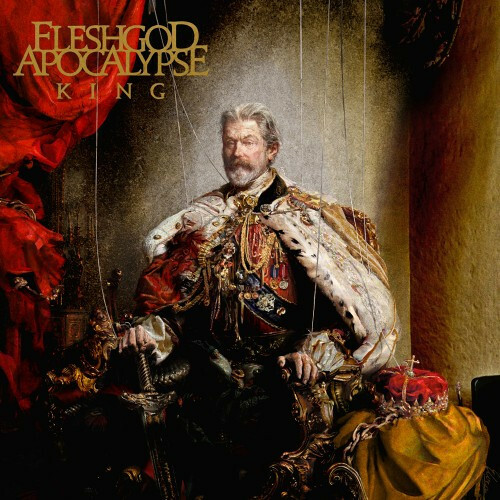 King is still blustery and bombastic, but this time around the music is allowed to breath, and as a result, much of it is the most fully-formed stuff Fleshgod have given us to date. 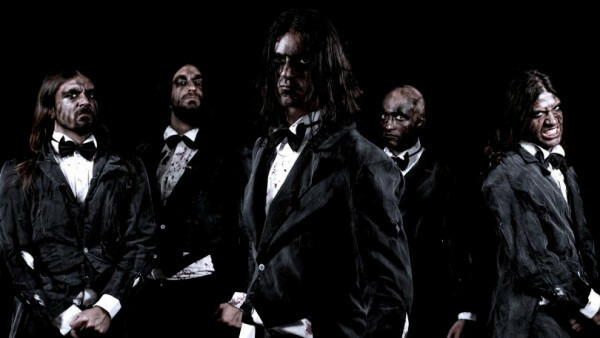 Fleshgod Apocalypse do have a couple of recognizable tricks up their sleeves, one of which happens to be a favorite of mine. The band have a knack for the occasional asymmetric songwriting exercise, and it makes an appearance early on in King, during “In Aeternum” – the album’s first song after the intro, “Marche Royale”. Some songs often have a very recognizable format – there will be a verse, a build, chorus, verse, build, chorus, and so on – and Fleshgod themselves have never stretched far from that; it’s one of the most universal foundations of music. But what Fleshgod do on occasion (and they have on all three discs – they do it during “The Violation” on Agony) is they’ll break it up by a one-time appearance of something a little extra before the usual chorus build. In “The Violation”, there’s an extra shouted bit toward the end of the song, and in “In Aeternum”, before the first build into the chorus, the band also have a shouted bit that sounds like the cheers of a rapturous crowd, crying, ‘Long live the great king!’ It’s a percussive and militaristic section, marked by quick hammering drums and horn blasts on the symphonic side. It’s a quick, added piece that makes the song feel as gigantic as the band promise their music to be. “In Aeternum” also serves as foreshadowing for King’s overall songwriting approach – it’s a much more dynamic album this time around, filled with multiple breaks, slowdowns, and as much instrumentation as the band could pack into King’s overall run time. “In Aeternum” even has a quick acoustic lead break, which, were it not for another song on King that I’ll be addressing quickly later, is likely one of the most opposite-Fleshgod Apocalypse things on this album. It rapidly goes from a million instruments at once to just one man, and a guitar; granted, it quickly accelerates back up the million-instrument mark, but the first time I heard it I was still pleasantly surprised. “The Fool” – which doubtless a lot of you have heard by now, as it was the first single – is probably one of the better tracks on King. It’s recognizably Fleshgod Apocalypse, and they’re in their comfort zone a ton on this song. But it feels like the band recognized that would be the reaction, and tried to change it up enough to be more than just another floor-destroying fast song. The intro to “The Fool” might be one of my favorite things the band have ever written, as it starts off with a classical harpsichord-sounding intro before the song really kicks in. At first it lures the listener into thinking that the whole song is going to go this route and just be a real snappy and quick track, an evolution of “Elegy” and “The Violation” – excellent for a Fleshgod song but nothing you hadn’t imagined before – but then the intro completely falls apart. The band actually slow down and stop. You can almost hear the gears grinding, as if all the instruments had lost track of where to go. There’s a breath, and then everything kicks in at full strength. And then the song continues the small trend of having the first section not be an exact clone of the others, with a section missing from the first when it comes around again in the second. It’s small, but again, it makes these songs much more dynamic. That said, when Fleshgod are playing to their strengths and just doing what they do best, there’s some excellent music there as well. When “The Fool” is going at its fastest, it’s a headbanging song with no equal. The song is snappy and over quickly, and while it lasts it’s an assault on the senses, a sensory overload in terms of instrumentation – but that’s the Fleshgod specialty. There’s another later song that sounds like it could have come right out of the Agony era: “And The Vulture Beholds” just moves from one sweeping section to another, a big, grandiose mess of instrumentation that falls to the listener to really sort out. The songs ring through clearly, but Fleshgod are continuing to play like they did on Labyrinth as well, with the guitar sections actually being fairly intricate and complicated. For those who truly miss when Fleshgod Apocalypse sounded like Armageddon incarnate, listen to “Mitra”. That song is a thundering three minutes, and the orchestration takes a backseat within it. It’s one of the most pared-down songs in comparison to most of King, but its a dense three minutes of death metal. Those two songs are broken up by “Paramour (Die Leidenschaft Bringt Leiden)”, which is actually an opera piece, with solo vocalist and some minor piano work. It’s probably going to cause a couple of turned heads considering the music around it, but it helps create a divide between the speed of the first half of King and the absolutely massive back half of the album. 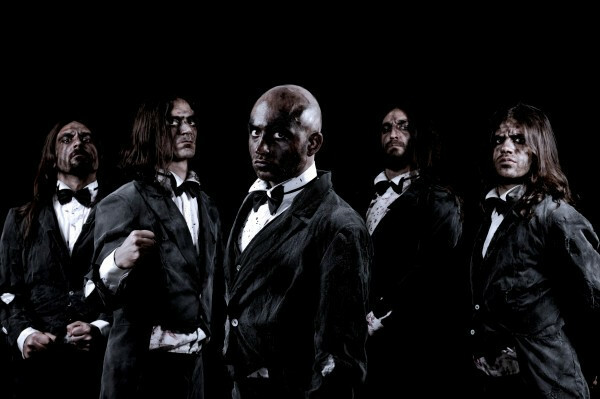 The mid- to latter-section of the album is also where Fleshgod bring singer Veronica Bordacchini back into the mix in full force. King’s latter half is where the huge songs lie – massive and somewhat slow-moving pieces (after “And The Vulture Beholds”), every one of them sailing well over the five-minute mark, including the song before the title track. “Syphilis” is over seven minutes long and it is a huge, operatic piece. Where “In Aeternum” could be viewed as the codex by which King was written, the intro song that shows off all the elements that will likely be in play, “Syphilis” is the summation of all that has taken place, the war-torn and destroyed battlefield. It also will likely provide a fairly interesting situation toward the end of the year when we will get to debate the fact that one of the heaviest songs released in 2016 is a track that bears the name “Syphilis”. It ties into a much larger concept that is the through-line for King, but it still has supplied a juvenile chuckle or two. Plus, the song is legitimately an enjoyable one and a great way to close out the grander musical portion of King. For all the talk of comfort zones, the band do still have one that they won’t let go of just yet, and that is the album closer — the title track and a piano piece. They’ve done this repeatedly since Oracles, and King is no different. Compared to the others, it probably ranks up there with the closing tracks of Agony and Mafia on the higher end of the scale, but after the huge closing songs of King, the piano section actually felt like part of the closing track. King bears the hallmarks of being a proper Fleshgod Apocalypse album, and even a great album by their standards. However, it feels like the band have taken what criticism has come their way and addressed it for the most part on King – which has led to some of the most dynamic songwriting the band have gotten up to so far. The mix is a lot less messier or prone to clipping, and everything rings through clearly. Every instrument has a purpose in every song – even in the simple movements, such as the orchestral bit in “Healing Through War”, which is basically like a horror movie soundtrack with the low-end string section just sawing back and forth – and the concept of King feels well-realized across its twelve songs. Including an operatic interstitial is an interesting choice that shows the band are not resting on their laurels, and the death metal part of King is a vicious experience. King sounds like a natural evolution of Fleshgod Apocalypse’s sound and one that will likely stick with us throughout 2016. King will be released by Nuclear Blast on February 5 and is available for order here. Now that was a review. ‘In a poem by the sultan under a nom de plume, he says “Even if the rivers became wine, they wouldn’t fill my glass.” In another poem he says “The wine is such a devil that I have to protect my people from it by drinking all of it”. My two concerns with FA as of the last album was loudness/ generally terrible production, and perhaps a lack of dynamics from a songwriting perspective. Sounds like they addressed those concerns pretty goddamn summarily, which means I’ll be buying the hell out of this record. For some reason this one’s still leaving me a bit cold. Not sure why. Though you’re right in the respect that they’ve got the natural mixing of Symphonic + Death Metal down right now (as opposed to, say, Septic Flesh, for whom the Death Metal parts come across as a complete afterthought these days). Hell of a review, and a hell of an album. My new favorite of theirs for sure. The stomping triplets near the front of “Healing Through War” are so damn heavy, and they give the song an intimidation factor that the “wall of blasts” sometimes doesn’t. Enough can’t be said for Tommaso Riccardi’s guttural vocals as well. “Syphilis” actually manages in its back half to be emotional and not just bombastic. I get the feels a little bit. I would say that while I respect the band for going with something like “Paramour…” and think it is a purposeful inclusion on the album, I just plain don’t like it very much and will probably skip it more often than not when jamming this one. That’s already what I do. Great review and awesome track! Didn’t buy Labyrinth, everything that I heard was a jumbled mess, but that was shortly after it’s release – so lets see how that stands now if I get that same feeling. As for King, wow, fantastic, just in production and sound, I really want to get this album! They really left the album sounds breath. Will be buying this!